MORGANTOWN, W. Va. (November 12, 2018) – On Veterans Day, in recognition of all those who have served in the Unites States Armed Forces, MX Sports Pro Racing and the Veteran Tickets Foundation have announced the renewal of their partnership for the 2019 Lucas Oil Pro Motocross Championship, sanctioned by AMA Pro Racing. This philanthropic effort will provide military veterans with the opportunity to obtain free admission at each of the 12 scheduled rounds of the world’s most prestigious off-road motorcycle racing series. A select number of tickets will be made available for each event at VetTix.org, a national non-profit, non-governmental 501c(3) tax-exempt organization. MX Sports Pro Racing and the National organizers will donate a total of 50 tickets to Vet Tix for each stop on the schedule, totaling in 600 across all 12 rounds of the championship. Additional donations will also come on behalf of series sponsors. Collectively, these tickets will be made available to both active duty and retired service men and women, and their families, at no cost. Each set of tickets will be made available two weeks prior to each respective round of the season, and can be claimed on a first come, first serve basis through VetTix.org. 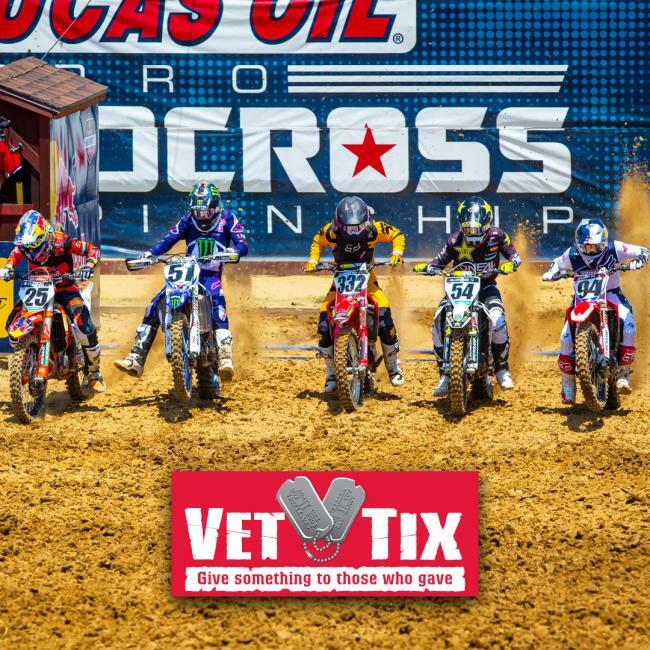 The 2019 Lucas Oil Pro Motocross season will be the eighth year of partnership with Vet Tix inviting active duty military and veterans to the races. Vet Tix holds valued partnerships with virtually all major sporting leagues and organizations like Major League Baseball, the National Basketball Association, the National Football League, and National Hockey League. Additionally, Vet Tix’s initiatives extend to sports entertainment franchises like the World Wrestling Entertainment and Professional Bull Riders, as well as motorsports organizations like the NHRA and several racetracks that host NASCAR and IndyCar events. The Lucas Oil Pro Motocross Championship became one of the first prominent motorsports properties in the country to partner with the Veteran Tickets Foundation back in 2012, and will continue to provide support to veterans of the United States Armed Forced for the eighth consecutive year. Over 600 tickets will be donated to active duty military and veteran families this season. Based in Phoenix, the Veterans Tickets Foundation was founded in 2008 by U.S. Navy veteran Michael Focareto. The organization has been providing free tickets to veterans and active-duty members of the military, and their families, ever since. Over the course of the past decade, the organization has given away well over a million tickets to veterans nationwide. 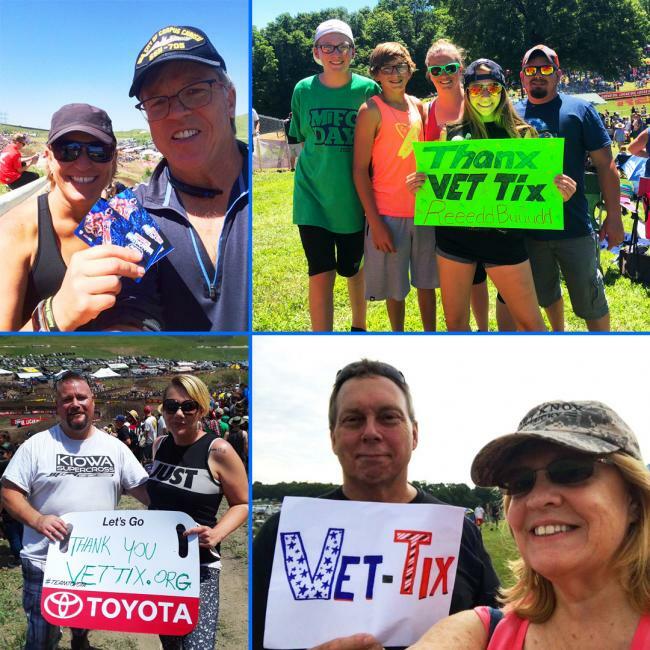 All active and retired military veterans can create an account on VetTix.org to receive emails and reminders about when tickets to the 2019 Lucas Oil Pro Motocross Championship become available. Additional information can also be found at VetTix.org. The Lucas Oil Pro Motocross Championship, sanctioned by AMA Pro Racing, features the world's fastest outdoor motocross racers, racing aboard the best bikes each factory offers, on the roughest, toughest tracks in the world. The 12-round series begins at Hangtown in May and ends at Indiana's Ironman Raceway in August. It includes stops at the premier motocross racing facilities in America, with events in California, Colorado, Pennsylvania, Florida, Michigan, Massachusetts, Maryland, Minnesota, Washington, New York and Indiana. The pro riders race on Saturday afternoon, with competition divided into two classes: one for 250cc machines, and one for 450cc machines. The Lucas Oil Pro Motocross Championship is managed by MX Sports Pro Racing, the industry leader in off-road power sports event production. The series is televised on NBC, NBCSN and MAVTV and streamed live on NBC Sports Gold. More information can be found at www.ProMotocross.com. Veteran Tickets Foundation (Vet Tix) is a national non-profit that supports the military community by providing free event tickets to currently serving military, veterans and family members of those killed in action, allowing them to attend sporting events, concerts, performing arts and family activities. Since 2008, Vet Tix has provided more than 2.8 million free event tickets to over 500,000 verified VetTixers, giving back to those who have given so much. Military and veterans experience many difficult transitions as they reintegrate into their families, communities, and eventually, into civilian life. Attending events improves morale, strengthens family bonds through shared interest and encourages service members to stay engaged with local communities and American life. Visit VetTix.org to learn more, and follow us on Twitter and Facebook.